I absolutely love the Autumn/ Winter months, but being a naturally hot person often means and that I'm walking around in cardigans way into December. Coats have always made me a sweaty mess and standard cardigans leave me feeling overly chilly, so I needed to find a healthy medium. I visited Next a good few months back during the slow transition between Summer and Autumn, and tried on a few coats that caught my eye. Unfortunately, I could already feel the sweats coming on so I started trudging out of the store, ruing my high body temperature, before bumping into this blanket wrap. 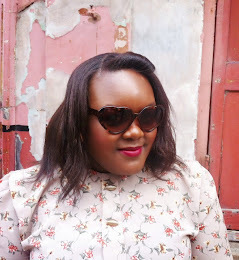 I tried it on, loved it, and made a mental note for the Autumn/ Winter transition. Eventually, I did order this gorgeous wrap and I haven't looked back. The wrap is mainly made out of Polysester (56%), so is a lot lighter than a standard coat would be. I'm able to feel nice and warm without baking, and the black and white woven pattern means it goes with literally everything in my wardrobe. It's incredibly versatile and can be wrapped in three different ways, but this is my favourite - lightly wrapped with the belt to show off my waist. It's easily dressed up or down and I've done both with great success. Nope, you don't have to be unstylish to be warm. I'm as snug, as a bug, in a rug. I'm Isha and welcome to my blog, An Autumn's Grace. This is my little space to share my style with a few beauty and lifestyle posts mixed in. If you would like to contact me, please feel free to email: anautumnsgrace@gmail.com. All images copyright of CreativeType Photography, unless stated otherwise. Please do not use without permission.